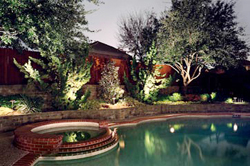 A beautiful landscape and a well-lit lawn can improve the appearance of your property and boost its curb appeal. We understand that finding the time to take care of your lawn and landscape can be difficult. That’s where we come in. At Property Optics, we specialize in designing and installing outdoor lighting and irrigation systems for a variety of properties including homes, corporations, municipalities, and more. 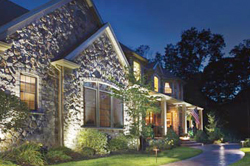 We’re the go-to lighting and irrigation business for all of Western New York. At Property Optics, our qualified professionals are licensed, insured, and professionally trained. Our 20 years of experience have allowed us to recognize what it takes to complete a job precisely to our customers’ specifications. We’re also a service-disabled veteran-owned business! We take pride in doing our best work on each and every project we take on. We are firm believers that customer satisfaction is the key to a good long-term business plan, and we are proud to be able to make your property shine day and night. Say goodbye to having to drag the hose throughout your lawn to water your plants, flowers, shrubs, etc. 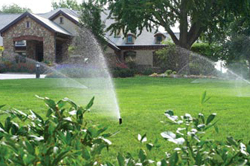 Having an automatic sprinkler system installed on your property takes the hassle out of the tedious watering process. Although it may be an investment upfront, it is a cost-effective way to keep your landscape maintained while saving yourself time. Our team will work with you to design a lighting system that meets all of your needs. Whether you want to light up your home, office building, landscape, or anything else, we can make it happen. We use LED technology because of the little maintenance the bulbs require and the fact that they are also free of toxic chemicals, so you can feel good about this reliable lighting solution. Want to get started? Call us for a free estimate and you will see the importance we place on your individual project.